The Mustang region of Nepal was once an isolated and independent Tibetan kingdom. Now part of Nepal, it nevertheless retains a rugged and mystical reputation. Divided into Lower and Upper, these different parts of Mustang are connected yet also quite different. They offer different attractions for the visitor, in terms of accessibility, landscape, culture and cost. Here are 9 reasons why you should travel to Lower Mustang this season. 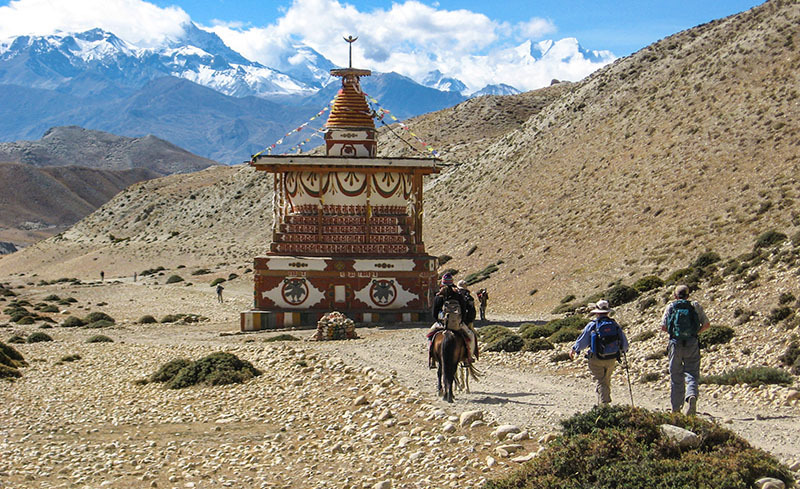 While most travel and treks in Nepal are best done in the spring and autumn seasons (March-May and September-November, respectively), this isn’t necessarily so in Lower Mustang. Because the region lies to the north of the Himalayas, in their rain-shadow, it doesn’t experience the monsoon. And due to the high altitude (2,700 metres+) the temperatures stay cooler at this time. While you’d struggle to get clear mountain views between June and August in most of Nepal, in Mustang they’d be almost guaranteed! Similarly, although winters will be colder up here than in Nepal’s main cities, if you prepare well with warm clothes, there’s nothing stopping you visiting in the winter months, either. (Just don’t plan a trip to Upper Mustang in the winter; the place goes into hibernation mode). Despite the four-seasons accessibility of Lower Mustang, do be aware that transport connections might be a bit trickier during the monsoon. 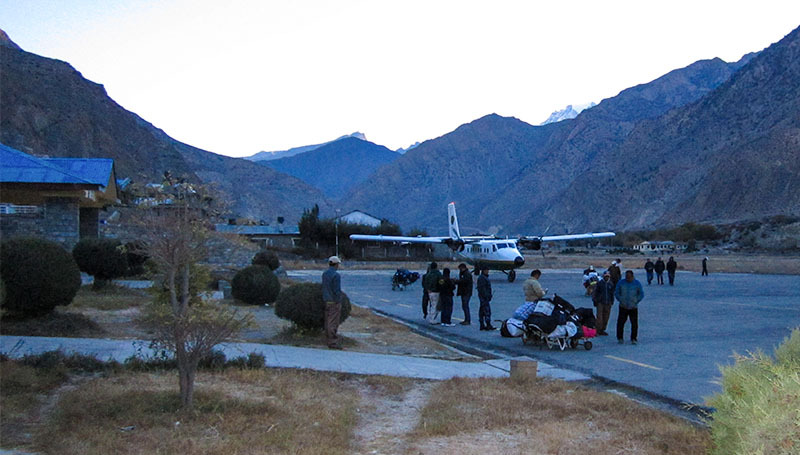 The only way to fly to Lower Mustang is from Pokhara to Jomsom. As Pokhara is affected by the monsoon, flights may be delayed or cancelled because of poor weather there. The road connection is also more treacherous at this time of year, due to wet roads, mud and landslides. If travelling to Lower Mustang in the monsoon, keep several buffer days in case of delayed connections. Upper Mustang is definitely an enticing destination, but for non-Nepalis, travel there comes at quite a cost. A US$500 permit, that is. These permits are for 10 days, and additional days cost US$50 per day. However, for a taste of Mustang without the price tag, stick to Lower Mustang. Only a cheap permit is required, which will allow you to go as far north as Kagbeni. While Lower Mustang might feel remote, it is actually very accessible. From Pokhara, Jomsom is just a 30 minute flight away. If you’re on a tighter budget, you can also travel there by road (which takes about 10-12 hours from Pokhara). Many other parts of Nepal, such as Dolpo or the Far West, also offer enticing scenery and amazing trekking experiences, but are much harder to access. 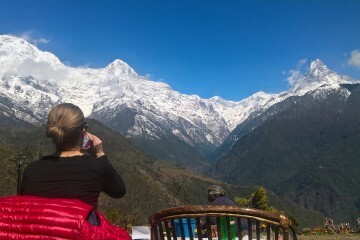 Nepal is famous for its low-budget teahouses, especially on trekking routes around the Annapurnas. 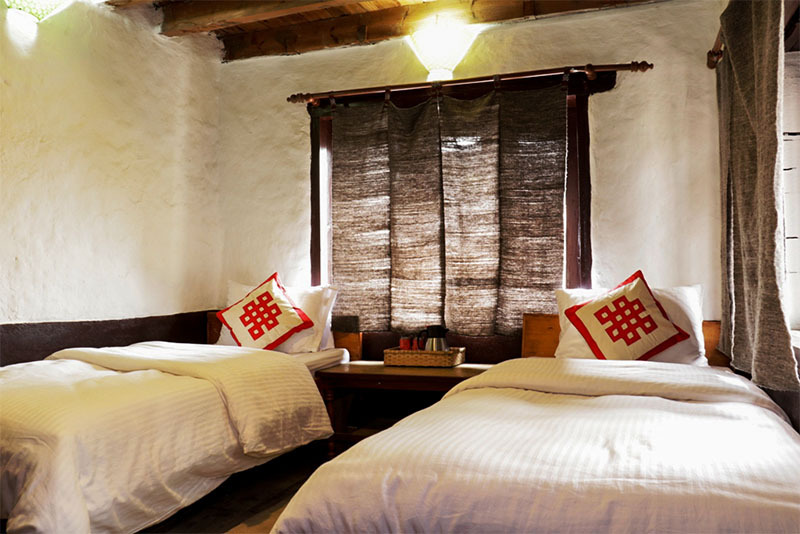 These are available in Lower Mustang, but so are some much more comfortable places to stay. If you want comfy beds, art on the walls, good quality food and atmospheric buildings, then there are options for these in Lower Mustang. In Jomsom, Om’s Home has friendly management, good food, and vintage Bollywood photographs throughout the rooms and property! It was established in 1976, so is quite a classic place to stay in Jomsom. There’s even a new Himalayan Java café next door. In Kagbeni, the newly opened Red House Lodge is located in a renovated old 19th century nunnery. As many of the original features as possible have been retained, such as Buddhist murals in the ‘yoga room’, and a richly adorned Buddha in the prayer room. 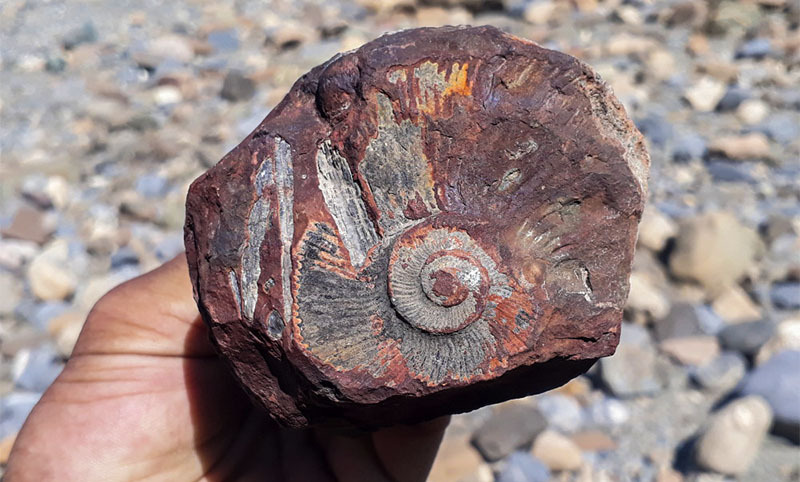 An amazing geological feature of the Annapurna region is the abundance of Jurassic-era fossils that can be found lying around. The curly, ridged ammonite fossils are a multi-million year old reminder of what the earth was once like, before the Himalayas were formed. Keep your eyes to the ground on any walk around Lower Mustang and you’re sure to find fragments of fossils, as well as whole pieces if you’re lucky. The Red House Lodge in Kagbeni is in the process of turning its public areas into a museum, which will display some impressive local pieces. 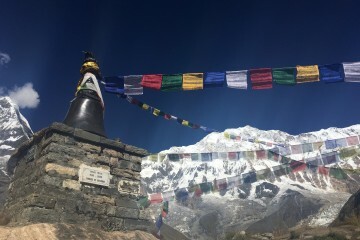 The holy site of Muktinath, which is sacred to both Hindus and Buddhists, is located at 3,710 metres. It’s possible to hike there and back from Kagbeni in a day, avoiding the vehicular road as much as possible, but for a quicker trip it’s easier to drive. Public buses ply the bumpy road carved into the side of the mountain, or a more comfortable private jeep can be arranged in Kagbeni. 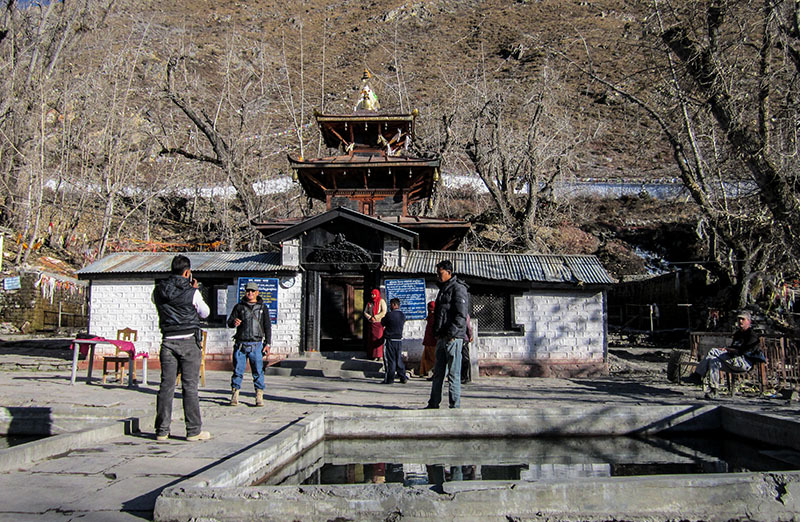 Muktinath may be more interesting to Hindus and Buddhists than other visitors, as the temple itself is not large or architecturally spectacular, but it is a good excursion nonetheless, as it’s a busy pilgrimage site of immense cultural value. Visitors will be offered a red tikka to the forehead in blessing. Don’t forget to check out the sacred fire that emerges naturally from the ground, as well as the animal-headed spouts spitting holy water. The temple is about a half-hour walk from the car parking area in the village of Ranipauwa, or you can hire a pony to take you up. 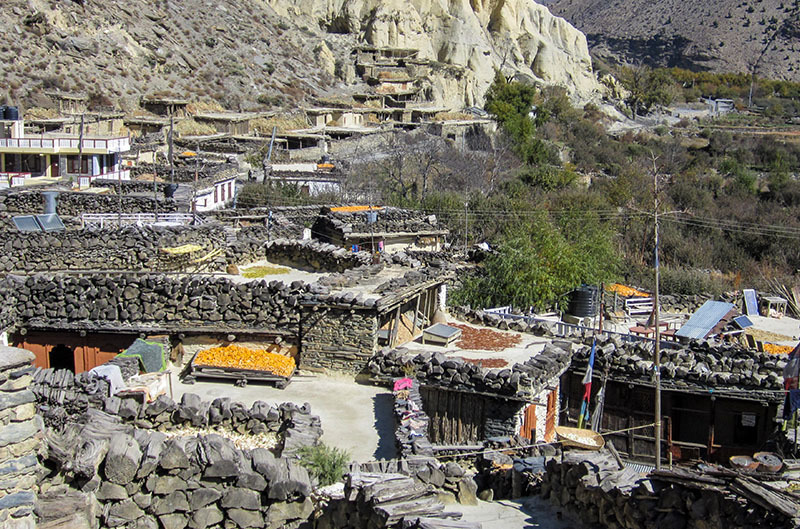 A good half-day excursion from Jomsom is a visit Marpha village. The path to Marpha is quite obvious, along a vehicle road (which isn’t busy) and beside the river. 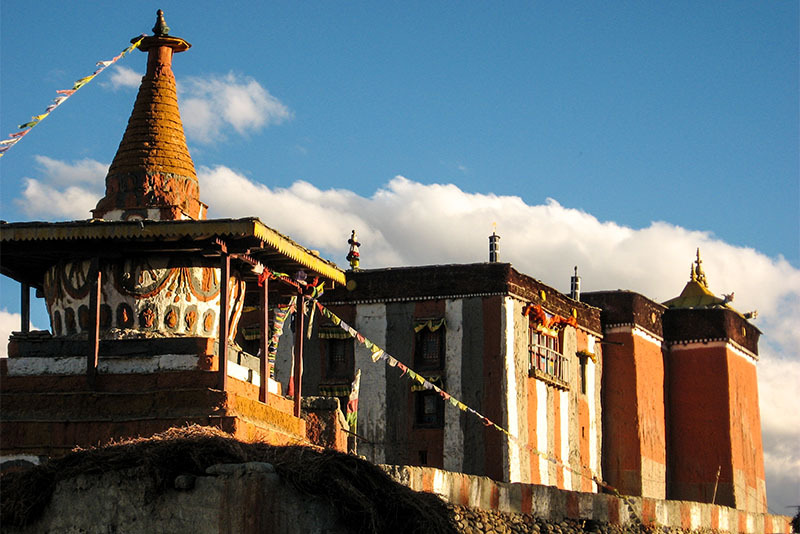 Marpha itself is a clean, pretty town watered by paved canals of the sort found all over the Tibetan-influenced world. It’s surrounded by green, irrigated orchards. A return hike to Marpha from Jomsom takes three hours, not including time to stop in Marpha for a slice of apple pie, which is definitely recommended. The Hindu dominance of Nepali culture fades as you cross the Himalayas, and Lower Mustang is rich in Tibetan Buddhist culture. 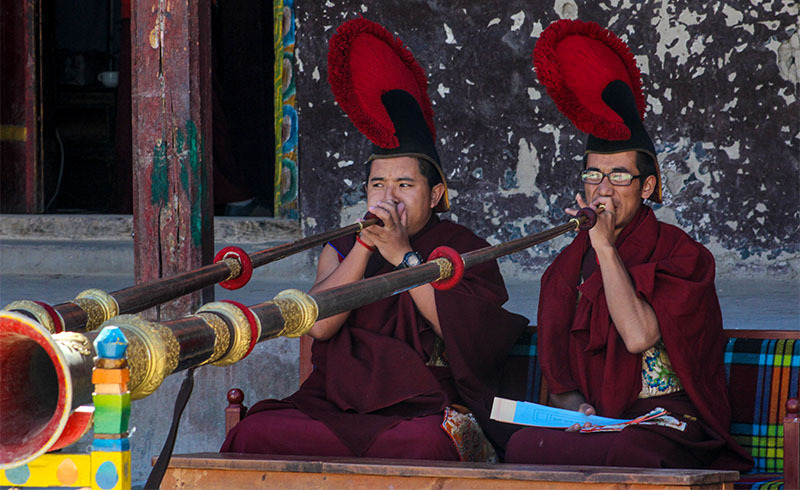 In Kagbeni there is an old monastery, from which you’ll probably hear loud horns being blown early in the morning. Prayer flags flutter along bridges, and large prayer wheels are spun in the narrow lanes of the town. The local people dress in a more Tibetan-influenced style, with women wearing distinctive colourful striped aprons and their hair in long braids. 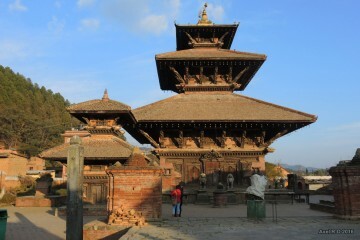 This is a culturally fascinating part of the country that proves how diverse Nepal is. 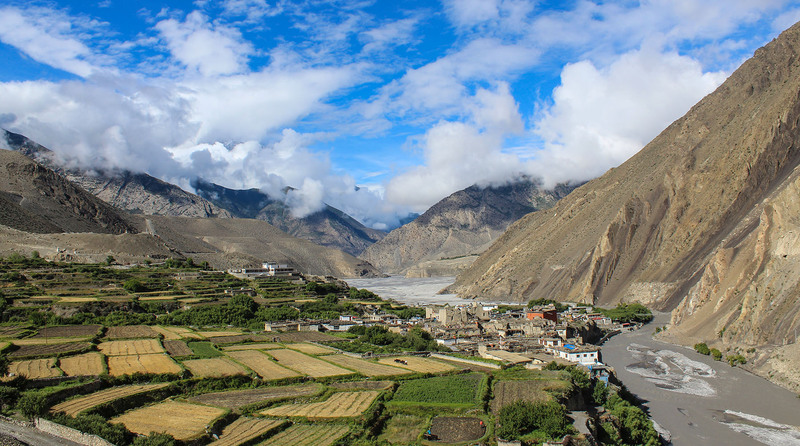 If you’re more familiar with the lush green hills and terraced rice fields of other parts of Nepal, then Lower Mustang will be quite a surprise. Because it doesn’t experience the monsoon, the land is very dry. The only patches of green you’ll see are irrigated areas of farmland around towns. Lower Mustang is geographically and geologically similar to Tibet and other areas in the rain-shadow of the Himalayas, such as Ladakh in India. Particularly impressive are the conical structures that look like overgrown anthills, and the meditation caves carved into the rocky sandstone cliffs. Whether you have three days for some quick sightseeing or two weeks for some more extensive exploration and trekking, Lower Mustang is an impressive area that is worth the effort of getting to. 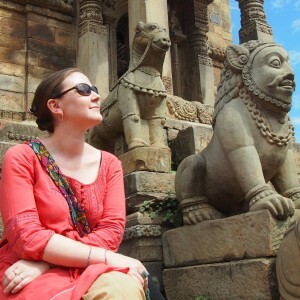 Elen Turner is a travel writer and editor with one foot in Nepal and another in New Zealand. She has a PhD in Interdisciplinary Humanities from the Australian National University (2012). Her travel writing has been widely published.